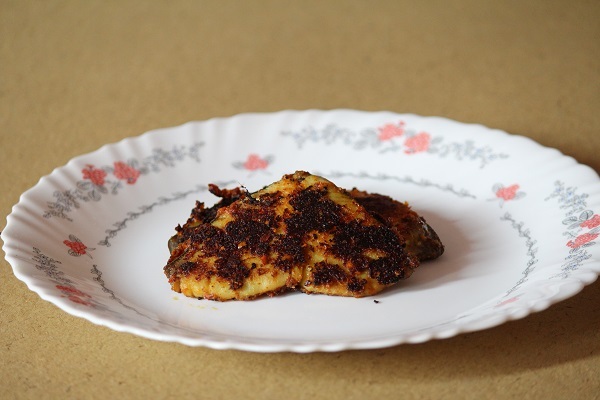 Today’s recipe is Kerala style fish fry. It is very easy to make and tasty too. You can make use of any kind of fish to make this tasty fish fry but I normally prepare this with king fish as my family love it. Now take a look at the recipe..
1. Clean fish pieces by applying lime and salt. 2. Grind together ginger, garlic, shallots, turmeric powder, red chilly powder, salt and pepper powder. Add little oil. Make a paste. 3. Marinate the fish pieces with ground paste and leave it aside for 30 minutes. 4. Heat coconut oil in a pan, and shallow fry fish pieces with curry leaves on medium heat. Close with lid to avoid spluttering. 5. After 3 – 4 minutes, flip the fish pieces carefully to the other side. 6. Pour little oil over the fish pieces and in low flame, fry for another 4 – 5 minutes. 7. Once crisp, remove from heat. Serve with onion rings. 8. Fish fry is ready and this tastes great with rice and rasam..